About 600 hungry guests are soon to arrive for Thanksgiving. Chef Reynolds Stewart is calm. “Don’t worry — but stay organized,” he advises. Reynolds brings a lot of experience, as food service manager and chef for Cityteam’s main San Jose kitchen, and with an impressive background in the hospitality industry. Cityteam is celebrating its 60th year. It now serves about 600 meals a day in San Jose, to low-income and homeless men, women and children of the area, and to residents of the residential program who have faced addiction and are in the act of transforming their lives. From early beginnings in San Jose, the non-profit organization has grown, and similar work is underway in other Cityteam centers in Oakland, San Francisco, Portland, Ore., and Chester, Pa.
For this Thanksgiving, Chef Reynolds and Cityteam are planning a special day, a treat for the individuals, families and the elderly who have so few of life’s comforts. “We are allowing our homeless community to make this their home for the day,” Reynolds says. From something as simple as a meal, sometimes significant changes can happen in a life. So he and his small team are preparing with care for the big day, even as they go about the ongoing business of delivering the center’s hundreds of daily meals for the hungry. Doors are open all day on Thanksgiving, 11 am to 5 pm. People will come in to relax, catch up with others and eat a full Thanksgiving feast, in a warm, dry and safe haven. They can spend the entire day together. The volunteers and staff intend to serve each guest with dignity and respect, as one big family. The day’s football games will be on screen. Volunteers will offer haircuts. Shoes and donated clothing will be distributed. A foot-washing station will be in place. Other hygienic services will also be offered. Although about 600 guests are expected, Reynolds expects to serve about 700 Thanksgiving meals, as people come, go, and return. There’s enough for seconds, too. In San Jose, this means 70 turkeys will be cooked. Reynolds and his small team of kitchen staff, residents of the center, and volunteer helpers, have already been prepping for several days — cooking and quick-freezing turkeys in batches, storing away the drippings and juices so vital for home-made gravy, and preparing the side dishes. Through careful work, Reynolds expects to get at least 12 meals out of each bird. Throughout the days leading to Thanksgiving he keeps a careful eye on food donations as they roll in. A healthy supply of cranberries from a leading grocery chain, for example, means he’ll be able to make a favorite side dish fresh from scratch – Cranberry sauce, prepared to his recipe with sugar, lemon zest, orange zest and orange juice, cooked until it bubbles and blends perfectly. To support the work, Cityteam has kicked off a drive for financial donations of any size, with its “When Help Meets Hope” campaign. Donating is quick and easy online at Cityteam’s When Help Meets Hope website. Reynolds also has good advice for cooks. Thanksgiving or any meal preparation, no matter how humble, can be stressful. Don’t worry — but stay organized. Write everything down. Write down your menu ahead of time. Write down the items you need for each dish and get them ahead of time. Write down the time it takes to make each item, and then work to a plan that has them ready ahead of time. After the turkey is done, put your sides in the warm oven, where they’ll stay warm and out of the way. Set your table right after breakfast so you don’t have to think about it when you are busy later on. 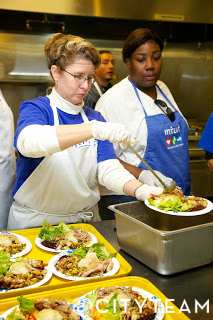 See a video of Reynolds explaining how the Cityteam kitchen team cooks 70 turkeys. Donate quickly and easily through Cityteam’s When Help Meets Hope website. Learn more about Cityteam on the Cityteam website. Check out our next blog as we tell you about how thousands of Thanksgiving food boxes and frozen turkeys are delivered to low-income families in all of our locations. With sky-rocketing home rental rates, more and more low-income families and the elderly are going hungry. Cityteam’s staff is passionate about making sure no one goes hungry this holiday season. Thanksgiving is fast approaching and this is the time of year many of us pause to think about everything that we have to be thankful for – our family’s health, a nice home, loved ones, and the ability to buy the things we need are just a few. For many Americans this year, it will continue to be a solemn time because so many of them are still suffering from the loss of jobs, loss of homes, health issues and loneliness. Our prayers go out to these families and individuals that are quietly holding on each day. We hope they arrive at our Cityteam doorstep because we want the opportunity to love them, share a holiday meal with them or provide them with a big Thanksgiving food box that will feed their families for days. We also desire to pray with them and make them feel like a part of our Cityteam family. Serving people with dignity and grace is so important. The most interesting part of all this is – Cityteam is only made up of 125 employees worldwide. There are not a lot of us, but we are very dedicated to serving people in need every day of the year. If you visit a particular Cityteam location – you might only see five employees or less. So how do we serve hundreds of thousands of people each year? It’s because volunteers show up every day to love and care for those in need. For some, it’s their first time volunteering and for others they are faithful volunteers that come every week or month. At this time of year, we at Cityteam are so grateful for all the volunteers that share their holidays with us. If you want to give back this holiday season by volunteering, donating a turkey or hosting a food drive – Cityteam is the perfect place. It would mean so much to those we serve and we know your life will be changed too. You can volunteer by yourself, or bring your family or company with you. It’s as simple as visiting our website at www.cityteam.org/volunteer . Come share your holidays with us.